Get ready for summer dips in the pool with children’s swim lessons at Fitness Plus for ages 6 months and older. All Fitness Plus swim lessons follow the American Red Cross guidelines, with progression levels as defined by the Red Cross’ Learn-to-Swim program. Fitness Plus offers both group classes and individual lessons. 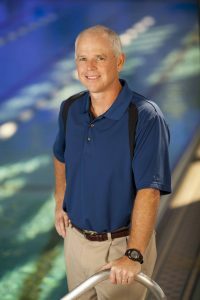 “We have low student-to-instructor ratios in the group lessons so children receive plenty of one-on-one time with their instructors,” says Doug Gannon, MSA, AFO, assistant manager for Fitness Plus. Swim lessons for the younger children take place in Fitness Plus’ warm-water therapy pool, which has a shallow end for younger swimmers. “The kids do not have to sit by the side of the pool until the instructor takes them out,” says Gannon. There are four spring sessions available beginning on March 23, April 7, May 4 and June 2. For more information, call 573-331-3355 or 573-331-5962.